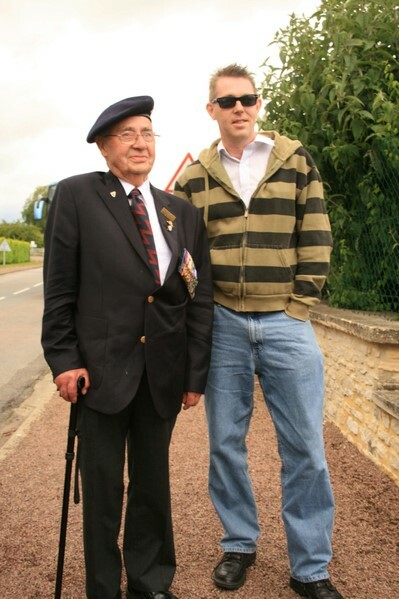 June 2009 saw the 65th anniversary of the D Day landings, a crucial turning point in World War II. 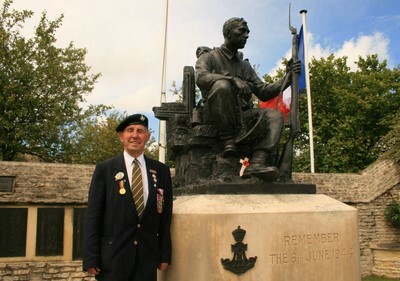 Among the veterans who travelled to Normandy to take part in the commemorative events was Roy Rowbotham of Keble Park South. Roy was accompanied by his son Robin, who has written a great account of their experiences exclusively for the bishopthorpe.net website. An early start (well for me) saw me and my father, Roy Rowbotham, in a taxi on our way to York station to pick up the coach that would take us to France. 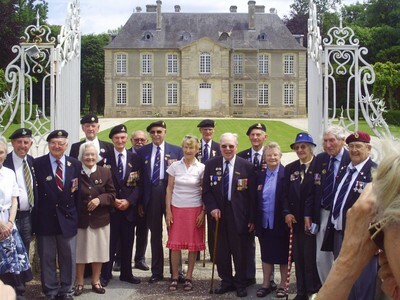 There we met up with the group of my Dad’s mates who would be going with us to celebrate, if celebrate is the right word, the 65th anniversary of the D Day landings at Normandy. I was tagging along as an official helper. If I wasn’t looking forward to the 15 hour journey I’m sure my Dad and his chums certainly weren’t, the youngest one there being 84 years old. We set off in hearty spirits though with a dash across country stopping off a few times to pick up the odd straggler including our guide Paul Reed. We eventually made it to Rouen late in the evening with no time even to hit the local wine bars, although a few of the group did us proud in the bar. An early start (again!) and we were off to Colleville-Montgomery (the latter part of the towns name being taken in honour of the famous Field Marshall). What seemed a disorganised shambles soon turned out to be a very pleasant ceremony and march past by the veterans. 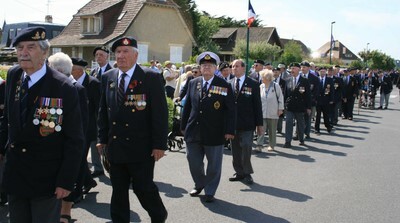 After the service the veterans were once again marching, this time down towards the beach of Colleville. They looked a fine bunch proudly displaying their medals and marching in time like the good old days. A fly-by by a couple of spitfires and a Lancaster made the event even more special. The march took them to a square by the beach where they received special commemorative badges given to them by the local schoolchildren – a lovely touch. 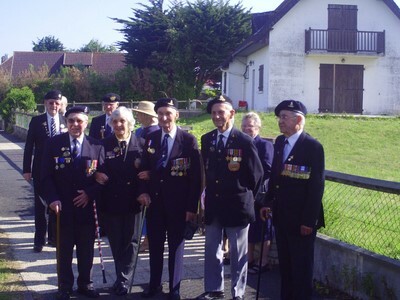 After the ceremony we hung around for a while chatting with the locals (as best we could given my atrocious French) who wanted to shake the hands of all the veterans and tell them how pleased they were to have them back. This was no empty gesture but sincere gratitude from people genuinely thrilled to meet up with their heroes. This attitude was to be repeated many times throughout the weekend from the local population. After a brief stop for fantastically fresh baguettes in Ouistreham on we went to the next service at Caens memorial gardens – a lovely open space and fitting lasting monument to those that lost their lives in Normandy. It was a very hot day and there was no messing about from my Dad as he informed the nearest senior officer that he wanted to sit for the ceremony – said officer duly obliging, leading him and a few of our gang to the ‘best seats’. This gave me and one of my fellow helpers a chance to take a look around the museum which was excellent – recommended if you’re ever in the area. We ended a long and enjoyable day with an evening meal in Caens before heading off back to the hotel at Rouen – where we finished off the evening in the bar, enjoying a couple of beers with some Harley-D bikers who were just finishing off a cross Europe tour. Off early again and this time headed for Bayeux . We built in a couple of stops to see some of the battle areas on the way and ended up in Bayeux just after 11.00. After a battle with some over officious gendarmes (eventually solved with help from one of the locals who left the poor gendarme in no doubt about the amount of respect he should show these old liberators!) 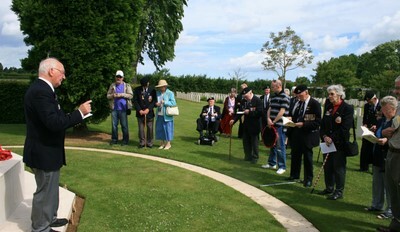 we made it in to the Bayeux cemetery and a service held in the presence of Prince Charles and President Sarkozy. My Dad got to have words with Prince Charles – telling him he ‘had the set now’ as he had met the Queen last time he was here. Despite the over zealous police activity (to be expected, I guess, with such dignitaries attending) it was a touching ceremony; well organised in a beautifully poignant setting and old Charlie spent a great deal of time chatting with the veterans which they appreciated. Fair play to him. Next stop was the Chateau La Longue, scene of German local headquarters and some fierce fighting in 1944. A memorable event for those that had been there all those years ago made even more memorable on the day as the lady of the house came to greet the party and give everyone a tour around the grounds. The old boys were truly touched by her gesture. The afternoon was to be a different story. Without going over too much old ground (see articles and letters in The Press) the ceremony at Arromanches was disorganisation taken to the extreme. 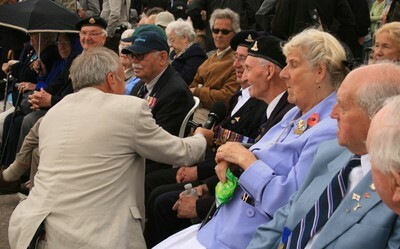 From the moment we got there no one knew what was going on, traffic was at a standstill, the car parks were over flowing and it was obvious the organisers hadn’t expected this many veterans and spectators. The afternoon started off happily enough – the sun was shining and most of the veterans managed to get a seat in the square where they took part in a badge giving ceremony and were treated to the odd marching band. Dad even got interviewed live on the BBC! The weather took a turn for the worse which caused problems, but another fly-by from the Spitfires and the Lancaster was greeted with great cheers and buoyed everyone up. The ceremony itself was very good although could have been shortened somewhat to lessen the time the veterans were stood in the pouring rain. I must admit to pleasant surprise when Gordon Brown and the rest of the VIPs joined the veterans on the parade ground for an impromptu rendition of Auld Lang Syne – a very touching moment. After the ceremony, with the rain still continuing to pour down, we faced the prospect of a long uncomfortable wait for our coach – but luckily our tour guide, Paul, had a word with his friend, BBC’s Dan Snow, who then led our cold, wet and bedraggled troupe to the BBC hospitality tent where they provided hot soup and coffee for the gang. So a big thanks to Paul, Dan and the BBC!! We missed our meal in Merville but sated our hunger in a service station on the way back to Rouen! This was to prove my favourite day. No deadlines to meet, no ceremonies to attend – we could take our time and spend the day visiting places the group wanted to see. The day started off with a trip to a cemetery and the burial spot of one of the party’s (Arthur Wragg) brother in law. Our resident lay preacher Burt Barrat gave a poignant eulogy – it was a very moving and humbling experience. After that we went on a tour around the Normandy countryside and once again were made very welcome by the locals. Lunch was taken at Pegasus Bridge, a place I was looking forward to seeing having read Ambrose’s book about the encounter, a brilliant feat of soldiering whereby troops of 6th Airborne led by Major John Howard held this key bridge over the night of the 6th June until relieved the following day (One of the members of the reinforcements was actor Richard Todd who would later play Major Howard in the film The Longest Day ). We visited the famous Gondree Cafe and the museum commemorating the battle which still houses the original bridge. After lunch we carried on our tour. First stop was the Green Howard memorial at Crepon as we had a former regiment member (Ken Cooke) with us. This stop was also notable for the meeting of an American couple who had just driven all the way from the South of Spain to ‘meet some vets’. They took pictures of some of our mob and were obviously very moved by the whole experience. Our final visit of the day was to a memorial to Hill 112. The Battle for Hill 112, known as the “Verdun of Normandy” was crucial for both sides in 1944 and the hill swapped hands several times until the Allies held it on August 3. 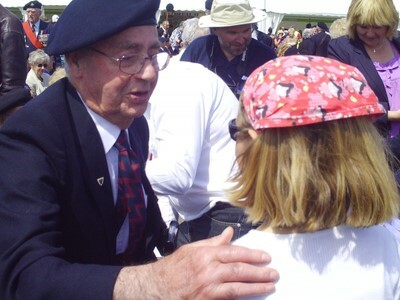 The battles were hard and bloody and we were honoured to have a veteran of the battle amongst us. And then it was time for return to the hotel, via supper in Caen. We were all tired and emotional but this didn’t stop a few visiting the hotel bar. We were off early the next morning and an uneventful trip home eventually saw us in York before midnight. 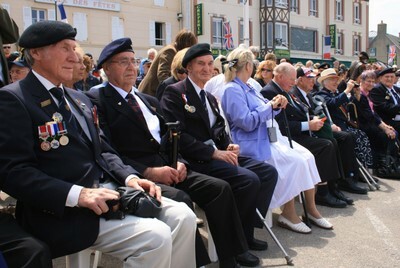 Despite the problems in Arromanches I think everyone had enjoyed the experience and found it rewarding. Personally I felt very honoured to be amongst this bunch of heroes. I was made to feel very welcomed by the whole group and it is an experience I will never forget. HI UNCLE ROY AND COUSIN ROBIN. BERNI HERE FROM IRELAND. I JUST WENT THROUGH YOUR LOVELY ARTICLE. WELL WRITTEN AND LOVELY PICTURES. IT MUST HAVE BEEN GREAT FOR ROY AND HIS BUDDIES TO TAKE A TRIP DOWN MEMORY LANE. WELL DONE TO THEM ALL. Well done Uncle Roy and all your veteran friends. I was immensely proud . You restored my failing faith in mankind. Thank you.